The re-emerging specter of nuclear catastrophe is once again haunting the world. 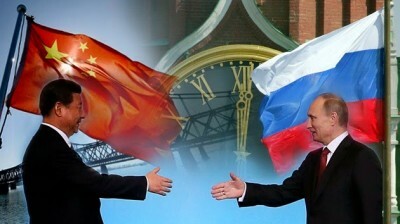 The West is trying to isolate and provoke two great, proud, powerful and sovereign countries; China and Russia. It appears that the pathological desire to gain (or more precisely, re-gain) full control over the entire world is fully restraining all remaining flickers of rationale and humanism inside the brains of the politicians and business ‘elites’ in Washington, London and elsewhere. The danger is real. It is enough to take a brief look at the map depicting the world at the beginning of the 20th Century, to realize that the West is capable of enslaving almost the entire Planet, by forcing through its colonialist and imperialist designs. Western imperialism has already exterminated hundreds of millions of human beings, in all corners of the globe. And even now, it is still murdering millions, directly and indirectly. Both China and Russia experienced the horrors of Western invasions. On several occasions, both nations had to turn to steel, in order to resist and to survive. And both nations are now, once again, standing tall, proudly facing those who are trying to break them, to force them into submission. It is becoming clear now that China and Russia will not back up. It is because they both want, above all, peace and justice for this world. They suffered terribly from the invasions and wars. They know how high the price of freedom and independence is. But if attacked, they will not yield. They will fight, no matter how high the cost. They would fight to defend their own people, and to defend the humanity, as they already have done on several occasions, losing millions, but in the end always defeating evil! China and Russia are not alone! They have allies all over the world. Some allies are simple people in the oppressed countries; others consist of entire countries from different parts of the World, like South Africa, Iran, Syria or Cuba. Until very recently, almost the entire Latin America stood by China and Russia and vice-versa. Great changes were taking place in Venezuela, Ecuador, Brazil, Argentina, Bolivia and elsewhere. Politically and economically, many South American countries began moving close, closer, towards Beijing and Moscow. The war against imperialism (re-) gained its new front. Attempts to destabilize Latin American revolutions arose almost immediately. The West began ‘organizing and then supporting the opposition movements’; funding hostile NGO’s, plotting and financing coups, demonizing new governments through propaganda and indoctrination campaigns. Treasonous and morally corrupt local ‘elites’ quickly joined forces with Washington; their loyalties were, for centuries, with Europe and then with North America, as well as with multi-national companies. I have been living and working in Latin America for many years. I know some of the continent’s greatest thinkers and revolutionaries, but I am also familiar with their oligarchs and feudal rulers. South American elites have no mercy with their common people. They cannot even be called “nationalists”. Just as the Western imperialists, they would easily sacrifice millions of innocent “un-people” (to borrow Orwell’s definition), in exchange for maintaining their privileges. As happened in Chile before the 1973 US-sponsored coup against the socialist President Salvador Allende, the local elites are now, once again, determinedly ruining the local economies all over South America, ‘creating shortages’, organizing and mobilizing right-wing unions, while withdrawing billions of dollars from their countries. For them it is no longer about business or making profits (they have plenty of money stored abroad) but about retaining control over their countries, often on behalf of the West. Recently, Argentinian socialism collapsed, and the neo-fascist President Macri gained power. Brazil was hit by a coup, which gave corrupt, mostly evangelical, and right-wing pro-Washington politicians, de-facto control over the country. Both Argentina and Brazil began dismantling their social policies, signing ludicrous deals with the North, including those that will soon allow the United States to build military bases in Tierra del Fuego and elsewhere. The West is achieving its goal; to torpedo BRICS, to weaken the anti-imperialist global alliance, and to discredit the Latin American model through its indoctrination channels. Almost overnight, Venezuela, Ecuador, Bolivia and Cuba had lost two of their economically most powerful Latin American allies. And the West will not stop. Venezuela is next on its mafia-style hit list, as well as Ecuador, most likely followed by Bolivia! I have just returned from South America. Argentina is waking up to a horrible nightmare. Brazilian people feel that they were swindled, fooled. There are protests shaking Argentinian and Brazilian cities. But many feel almost hopeless, faced by such Machiavellian, complex and ‘perfectly’ organized operations of their West and the local ‘elites’. I have also worked, recently, in Ecuador, where I got convinced that the West would never give up its attempts to destroy all progressing governments and regain full control over what it believes is its ‘backwater’. The tactics that are used to destabilize entire countries are the same everywhere. For many years I have been travelling to virtually all corners of the world, wherever the Empire has been trying to break the will of the people: from Ukraine and China, to Zimbabwe, Eritrea, Iran, South Africa, North Korea, Venezuela, Cuba, to mention just a few most ‘obvious’ places. My latest book: “Exposing Lies Of The Empire”, is more than 800-pages ‘heavy’, and full of examples of how those tactics are applied, on all continents. But in South America, the West is now attacking almost the entire continent, and it does it openly, with no shame. To defend the independence of this continent – South America – is essential for the survival of our humankind. This is the frontline now! But it is the frontline where one nation after another is collapsing, under the terrible pressure of destructive, mainly foreign forces. It goes without saying that if the Empire wins here, it will try ‘not to lose momentum’; it will immediately move to another part of the world that is still standing. The destructive work will continue, (while hundreds of millions lives get ruined) until the Empire’s final victory, or until it gets decisively confronted and stopped! In Caracas, Quito and La Paz we are now witnessing an epic fight for the entire continent, but also indirectly for Moscow, Beijing, as well as for those still defenseless countries scattered all over the world. It is because the fight is essentially for the survival of the basic principles of humanism, decency and solidarity. It is a battle against the most cynical and oppressive forces on Earth! In short, it is a battle against ‘imperialism’, which is synonymous to ‘fascism’! Venezuela is still standing, but it is screaming, suffering, and in terrible pain. It cannot go on like this for too long; it cannot survive alone! It either receives some substantial help, or it will eventually collapse. The economic scavengers are already encircling its weakened body; even speculating and betting on its foreign debt. The ‘opposition’ is so sure of its upcoming macabre victory that it is already allocating to its members, posts in future governments. The point has reached when Venezuela cannot defend itself alone, anymore. For years it topped the hit list of the Empire. For years no effort to ruin it was spared: coups, assassinations, economic blackmail, and a media war! And still, for so many years, Venezuela has been showing great solidarity with the rest of the world. It has stood at the vanguard of the fight against imperialism. It was spreading foreign aid all over the world, while it was flying (via TeleSUR) those optimistic and inspiring voices of the Latin American revolution, to all corners of our Planet (I made five documentary films for TeleSUR, in several conflict zones of the world, under almost impossible circumstances; something that makes me, until now, immensely proud). Like China and Russia, Venezuela refused to crack even under tremendous pressure. It began building a new, great and united South American fatherland, returning optimism, zeal and hope to the people of the continent that has been, for centuries, tormented and continuously raped by the West/North. Not everything was done ‘perfectly’, but nothing in this world is or should be expected to be perfect. Venezuelan (Bolivarian) Revolution is called the process; it is a long and complex journey, but a breathtaking journey nevertheless – from slavery to freedom, to internationalism and social equality. Venezuelan people are now paying an immense price for not abandoning their principles. They are castigated mercilessly by the Empire, for making their own choices, for defending their freedom, and for refusing to return to subservience. But above all, they are punished for returning hope to others, for inspiring others, millions of others, all over the world! Because hope is what the Empire tries to strangle, mercilessly. Venezuela clearly demonstrated that a different world is possible, that solidarity is still alive, and that the revolution can serve the people. If Venezuela dies, at least it would die standing. 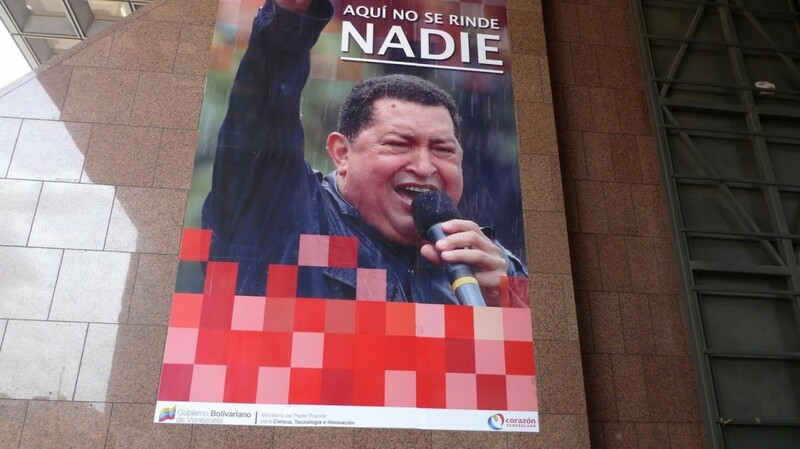 “Here, nobody surrenders!” These were words of Hugo Chavez, printed on the iconic election poster, after his death. Here Chavez, already gravely ill, with his face covered by raindrops, was defiantly clenching his fist. Chavez went all the way and Venezuela followed him – a true revolutionary and his remarkable Bolivarian motherland. Yes, if it would have to die, Venezuela would die standing. But it should never be allowed to perish! I have both Russian and Chinese blood in my veins. I was born in Russia. And I spent many years in Latin America, writing, making films, covering wars and then revolutions. And followed then, by the Western subversions! For me an alliance, and even some sort of unity between China, Russia and South America, is the essential pre-condition for the survival of the humanity. The West knows that such an alliance would break its monopoly on power; that all three models are now inspiring billions of people all over the world. These models may be different to some extent, but the bottom line is always the same: putting the people first, while trying to deter neo-colonialism and imperialism. If that bottom line were to prevail, that would mean the end of a long and bloody period of Western global dictatorship. It is that simple! The West would rather murder billions than to accept its defeat. Because ‘defeat’ would mean that its countries would have to finally behave as equals towards the rest of the world, something culturally and psychologically unacceptable to most of North Americans and Europeans. The world has to finally defend itself. It has to defend its people. Too many lives have already been lost, too many nations plundered and ruined. Now countries under the attack should embrace each other, help each other, and not to allow each other to fall. The Western propaganda machine is spreading sinister but very effective lies that “all large countries are the same, that they have identical imperialist tendencies”. The only way to contradict such fabrications is to offer concrete and bright examples to the contrary. The world has been drowning in the cynicism and nihilism administered by the Empire. In order to snap out from depression, in order to erect the great flags of the resistance again, people need a substantial dose of emotions, optimism, poetry, and human warmth. They also need true leadership. They need big and powerful countries like China and Russia to show the way. To inspire the world, it is not enough to do “economically well”, or to be “strong” (although those are essential pre-conditions for progress and even for survival). What people all over the world are longing for, are solidarity, social commitments and internationalism. Both China and Russia are offering exactly those, and have already been for many decades. But it is often done in a subdued and modest way. And therefore, for the lackey Western mass media, which still controls the flow of information in most parts of the world, it is still easy to omit, and even to deny the truth. To bail out, to rescue Venezuela, would send a powerful message to both the Empire and to the rest of the world. It would be a truly positive message, full of optimism, decency and pride. In Russia, a country that suffered immensely from countless foreign invasions, there is one important term – “наши” (“ours”). The world is clearly divided between those who are “ours” (our loved ones, our comrades, compatriots, friends and allies), and enemies. By nature, the Russian people are immensely loyal to those whom they have already accepted as their close ones, as “ours”. They are loyal to their comrades to the point that they would, without even blinking, die defending them or give them their last shirt or a piece of bread. There is no limit to the generosity towards those that Russian people love. And Chinese solidarity is legendary as well. Otherwise, how could this enormous country lift almost all of its citizens out from poverty? And this is exactly what is happening now. “They are beating our people!” Venezuela, our beautiful and proud sister, our comrade, our ally, is being tortured, humiliated and devastated! Let us stand up. Let us not allow Venezuela to be violated. I have lost all my hope for the hypocritical, toothless Western “Left”. With some bright exceptions, it will do nothing, absolutely nothing practical to help! As it did nothing to rescue Cuba when Cuba was bleeding. It had to be China, after all, which extended its powerful hand across the seas towards Havana saving the revolution! And now, again, only Beijing and Moscow would be able to make that decisive and powerful epic gesture! As was demonstrated when China rescued Cuba, and is now being shown where Russia is fighting for Syria; these two great and brave nations are willing to get engaged when the time is ripe, and therefore capable of saving Venezuela! President Xi Jinping, President Vladimir Putin, I am writing this letter with great respect for both of you personally, and with profound admiration for your countries. In many ways I also belong to both Russia and China, despite my determined internationalism, and my perpetual lack of “home”. I also write this with great hope. I do not know how to resolve the situation practically – how to save Venezuela in a sensible but also truly determined way. I cannot offer any practical political advice to the two of you – great leaders of two enormous countries. I have merely outlined the global situation, the murderous drive of the Empire and the plight of Latin America, the continent, which is so deeply engraved in my heart.